Drive chain repair of agricultural machinery of simple cultivators. Were delivered items narrower than the original chain and can not be used for a moment? I thought, but rather I could firmly fix without play. 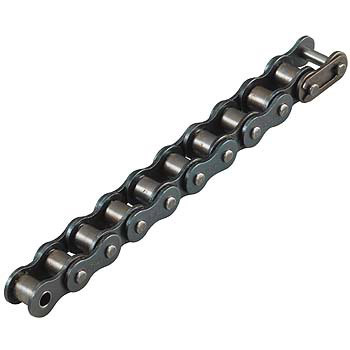 Although the connecting piece is attached, it is quite toneful although it is used as an endless chain with a chain cutter. Although there is no direct relation, the roller chain is a place I want to pay attention to grease out. This review is about item#35274924. This review is about item#5749563. The chain I was using was stretched and replaced with this item. If ordered to a printing machine maker it definitely should have done 20,000 in a set, but thankfully for themselves it was considerable cost savings. Although I am able to use it without problems, I think that it is safe because durability is the same thing as the previous parts. This review is about item#5749527. This review is about item#05749527. I had a rather unreasonable groove moat at Trecircher and the chain had run out. Although it was uneasy to supply the parts with the old machine, it understood that it can correspond with the general-purpose chain and it is working perfectly when exchanging it. I am very satisfied. This review is about item#5749545. The strength of monotalou is to align everything. Thanks to you, I could play the snowplow. Product is good, price is reasonable and I like it because it has a length of 3 m.
This review is about item#35274915. This review is about item#05749545. Can be used without problems. It was good to purchase at a low price. I used it for repairing the floor mat washing machine during vehicle cleaning. I was saved because I could repair it cheaply. This review is about item#35274906. Used as part replacement for the transport part of the manufacturing machine. It is a part commonly used as standard standard form, so there is no problem at all. It is high in strength and safe without pulling even if pulled. This review is about item#05749563. The drive chain of one wheel management machine has expired, it has been renewed this time and replaced with a new one. The size is perfect. I only have to look durability. The price is cheap and it is the best as a replacement part. Cut according to the length of the chain and connected with a joint link at the same time, it became a new item. Thank you for sending us soon. Farm work finished successfully. Because the wheel drive chain of the grass cutter was damaged, we ordered this chain without ordering genuine parts, and repaired it. Repair costs also cheaply rising and satisfied. I am using it without problems.